When you go grocery shopping, do you ever check out the “Enjoy Tonight” or “50% off” racks? If not, you should! I often buy half-price meat and, if I don’t need it “tonight”, I pop it in the freezer to be enjoyed sometime soon. Same goes for baked goods – they’re a great buy on the sale rack. My supermarket marks down their artisanal bakery bread in the late afternoon, which is usually when I shop. In turn, we often have delicious bread with supper. But, as a family of four, we don’t typically eat the entire loaf. So, instead of wasting it, I cut it up into bite-sized pieces and make my own croutons. If it sounds complicated, I can promise you it’s not. 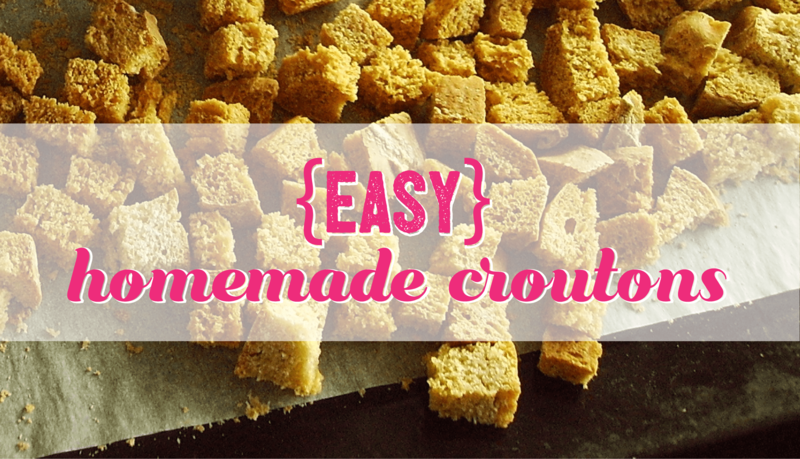 It saves me from having to buy croutons, and mine are much tastier! Set your oven to 250 degrees F. Place the cut up bread cubes on a cookie sheet, spray with olive oil (or brush with melted butter) and sprinkle on garlic powder, onion powder, salt and pepper. I like to add some fresh grated parmesan cheese, too… yum! Bake for 20-40 minutes, or until bread is crispy. Cooking time depends on type of bread; dense breads (like rye) will take longer than Italian or French loaves. If you like really crispy croutons, you can leave them in even after you’ve turned off the oven. Check them every 10 minutes or so, to ensure they’re not getting too brown. Energy-saving tip: If you’re already using the oven at a slightly higher temperature for another dish (no higher than 350 F, I’d say), you can put the croutons in with it and cook for a shorter period of time. And remember, croutons aren’t just for salad…they add a special touch to homemade soups, too. Enjoy! Enter your address to subscribe to this blog and receive new post notifications by email.